Definition: An optical phenomenon, located in an area of the home usually designated for automobiles, but usually ignored as if it was not real. An area capable of beauty & pride for homeowners, but usually posesses a deteriorating concrete floor while being cluttered with meaningless junk that has not yet found its way to local donation centers. Most likely, you visit your garage every day. Most likely, your neighbors, friends and family also visit your garage as they enter your home. The garage, for obvious reasons, unfortunately becomes neglected until it is such an abyss that it is too far gone to be saved. Additionally-the garage floor, where items designated for the garage sale you have been meaning to have for the last three years, is rapidly deteriorating each year. The following provides some common fallacies that may provide you motivation to address the most neglected area in most homes – the garage and more specifically, the flooring in the garage. “It Doesn’t Last”: Until only a few years ago, most homeowners either hired a local painter to install a garage floor coating or went to the local DIY store and attempted to install flooring themselves. Improper preparation (muratic acid, pressure washers, or no prep at all) is the cause for this mistaken belief. Most homeowners see neighbors floors that they attempted to install themselves. There are inevitably four bare spots where the tires sit among other defects after only a few years. Professional epoxy installers, such as Granite Garage Floors, dedicate 70-80% of the time that they are in any garage on preparation which is paramount to a flooring system that will last 20+ years without “Hot Tire” voids. Without this knowledge and experience to properly prepare the concrete and address voids via patching with epoxy versus patching with additional concrete (the worst solution EVER! ), any product other than a professionally-installed epoxy coating system is a temporary solution. However-there are indeed pros that use techniques and products that have been proven to last 20+ years with no peeling or cracking. 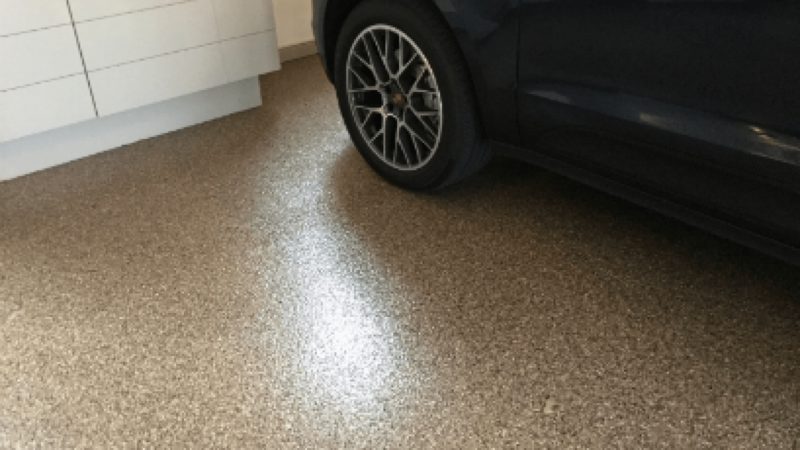 “Garages are not meant to be cosmetically appealing”: The look and feel of epoxy is one that brings the normally boring, dark, and drab garage area into an entirely new light. Epoxy will feel different to the foot and also provide the warmer & more welcoming feeling. Kids will gravitate to the garage to play and adults will frequent the rooms more often due to the clean, finished, and bright appearance. Designer colors are available to provide a plethora of choices to match a homeowner’s needs. Contrasting wall colors as seen below can even accent the floor’s impact on the overall beauty of a basement or garage setting to allow for a beautiful room to emerge out of what was previously an area of embarrasment to most homeowners. 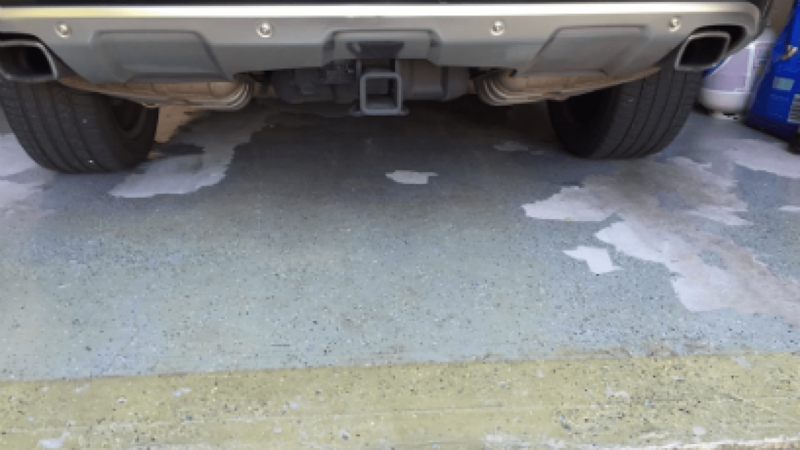 “Epoxy is too slippery”: Especially in garages, traction is a higher priority for most people knowing there is moisture often present after rain & snow. 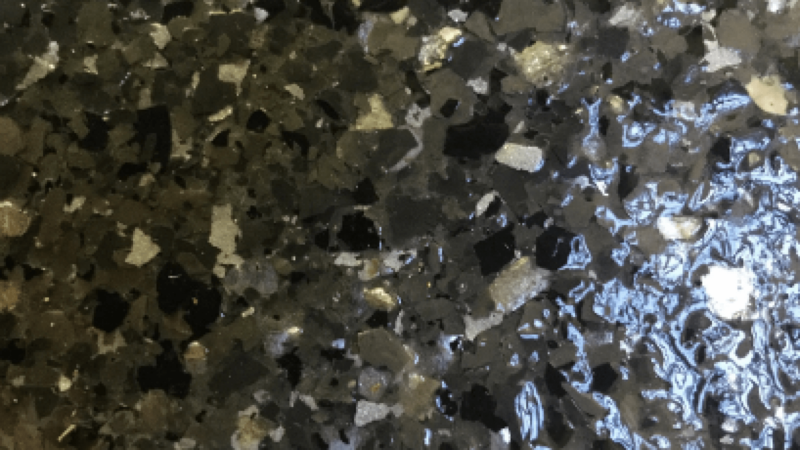 The functionality of the polymer flake (that appears to look like Granite) used in epoxy coating systems is key. The texture created by the layering of these chips provides an orange-peel like surface that allows for sufficient friction from shoes, bare feet, and even tires to allow much more slip-resistance than bare concrete. “It’s too expensive”: Whether you have a garage that is brand new, starting to deteriorate, or is has conditions as severe as the concrete cracking from rebar heaving, the traffic and stress that a garage sees on a daily basis is worse than any other area of the home, with exception of the home’s roof. The garage will deteriorate and if not protected, will need to be completely torn out which will ultimately cost $10-15/square foot and be unusable for up to 30 days or more. Tile & carpet are rare in garages, but also cost 2-3X what epoxy will cost to protect the floor or replace it entirely. Investing in a coating to protect one of the most abused areas of the home will result in “real” benefits to the longevity of the home. 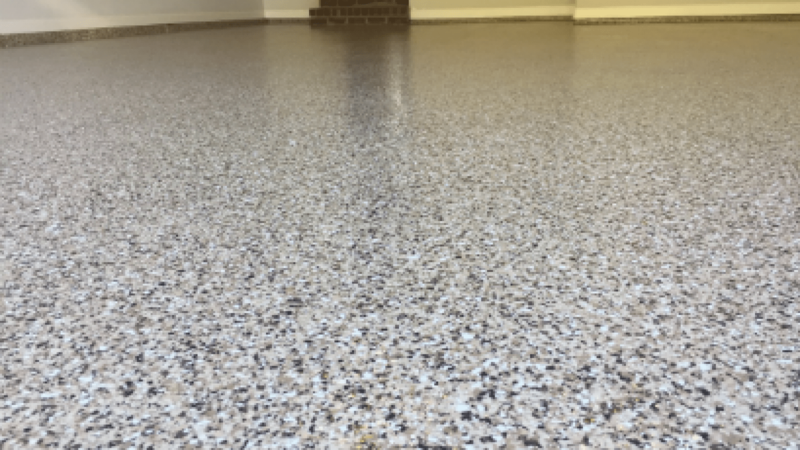 A professionally installed, epoxy coating system also translates into more “real” square footage in a home that is actual living space….and as you can guess – more livable space ultimately translates into better resale and home value. “It takes too much work”: Getting rid of your excess is easy via donations and a purge is always liberating. Even if you have tangible garage contents that you do want to keep, there are easy turn-key methods to have your garage transformed in days. Temporary storage container can be placed steps from your garage and are available from various company’s at a nominal fee, which allows you up to 30 days to clean-out your garage and then replace contents being kept back into your garage space. The installation of a Granite Garage Floor takes one or two days and you can walk on the floor the following day making this a quick, inexpensive way to liberate a large area of your home from clutter. Investing in an area that can be up to 15% of a home’s total square footage, protects it from dirt and grime and tranransforms the primary entry point into the home is a wise upgrade for today’s discrminating homeowner. Don’t procrastinate through another year allowing your home’s value to decrease based on the poor condition of your garage. The “Garage Mirage” that you have ignored for years can be a huge asset of substance if addressed properly that will stem the tides of deterioration. 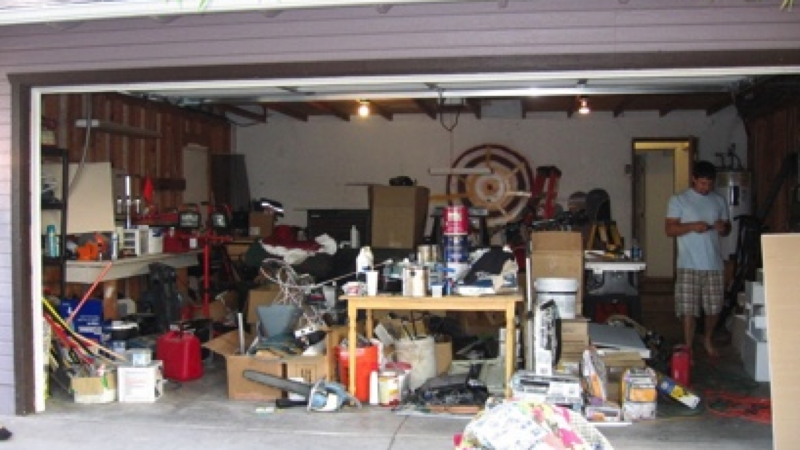 Acknowleding your garage’s poor condition will provide you a large, tangible area of your home that will instead appreciate over time & will feel make you proud to habitate….and that is no illusion.